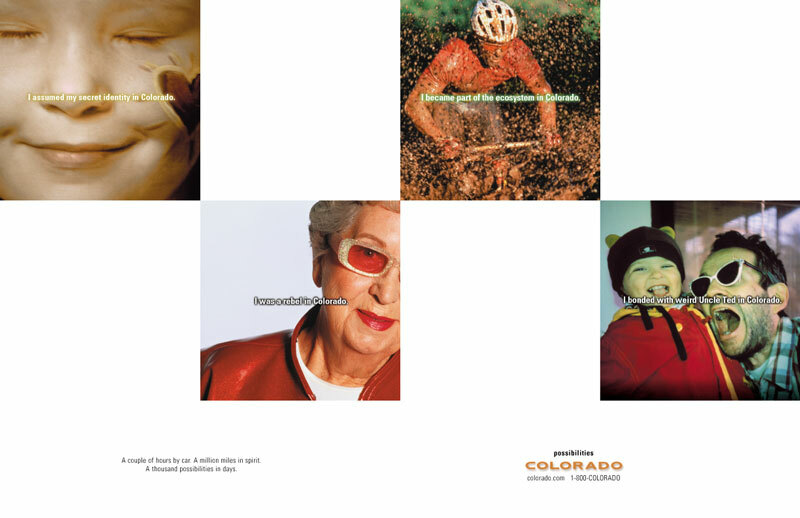 Have you seen the “Possibilities” commercial for Colorado Tourism? They play it alot on BBC America, and it’s annoying. It’s scary to discover that the online version is extended and even more doofy than the one they play on TV. The dialogue is really silly and on top of that, the actors are really bad. The kid/cowboy is a mumbler, and once they get to the woman claiming “I was a mud-encrusted, cucumber-eyed goddess in Colorado” you find yourself never wanting to see the commercial ever again, let alone go to the stupid state. The spokesperson that takes the cake, though is the incredibly funny-looking guy who says “I was incognito in Colorado.” And he enunciates every syllable of the word incognito so that he sounds ridiculous. Seriously, watch it and you’ll see what I mean. And why on earth would you need to be incognito in Colorado? Are they trying to encourage fugitives to come to Colorado and hide from the law? This online version has even more stupidity, though: “I was Tundar, overlord of great high pointy mountains in Colorado!” What? A little girl saying “I was visiting my weird Uncle Ted in Colorado” — um, you want to advertise Colorado as the residence of people’s weird uncles? I thought that some things were better not talked about. The Print ad with this same text is even scarier. “I was unafraid to wear a plaid hat with earflaps in Colorado.” — Someone send the guy a memo letting him know that plaid hats with earflaps have been cool for several years now. You can tell they didn’t spend a lot of $ on this commercial. At least not enough to hire real actors. The also didn’t spend much on their website, either, because their home page takes 5 minutes to load on a T1 connection.